Gerard Lyons didn’t quite know what was going on. The 8-year old Riverview Elementary second-grader normally would be heading home on a Wednesday early release schedule. Instead, he sat in a classroom, full of news cameras in the back and important-looking people crowding the door. Gerard and his friend Owen knew that Donald Trump was the president. They knew Trump can’t spell “hamburger.” It was only after an aide of the governor whispered in their ears that they knew who was going to pay them a special visit, and what he did. “He’s the president of California,” Gerard said. In some ways, he’s right. Gavin Newsom visited the Central Valley for the first time since taking office six weeks ago. And, he signed his first bill, AB 72. The budget bill passed both houses of the Legislature with nary a “no” vote. “We’re grateful to all of you who participated as taxpayers in supporting these efforts,” Newsom said with a smile. Last spring, officials deemed the water at Riverview unsafe. Notices, posted on the water fountains, warn of high levels of 1,2,3-trichloropropane (TCP). The standard for safe water is 0.005 micrograms per liter (ug/L). The 1,2,3-TCP at Riverview is 24 times as high as the standard. Trustees with the Kings Canyon Unified School District say the water quality didn’t change, but state standards did. The taps are turned off, and water coolers are stationed around campus. For Newsom, the thought of parents rushing to school to drop off water bottles their kids may have forgotten was too much to bear. 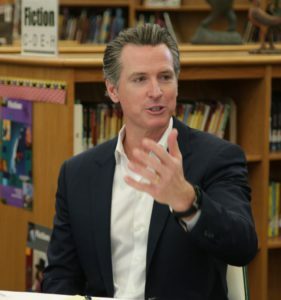 “It’s disgraceful, it’s an embarrassment and God bless those parents for giving a damn about their kids,” Newsom said. “And thank you to the school district for letting them know about it and having the courage to do something about it. They need our support. I need to have their back. I need to have their parent’s back. Newsom’s message to the scholars: You don’t have to be an elected official to engage in change. He mentioned Cesar Chavez, Martin Luther King Jr., and Gandhi as examples.